58 days. If you like Sugar Snap, you'll love Super Sugar Snap! This improved variety sets plumper pods earlier in the season, with remarkably higher yields, and far better disease resistance than its predecessor. Enjoy the exceptionally heavy harvests of sweet, thick-walled, stringless pods straight out of the garden, on a fresh veggie plate, or cooked in your favorite dish. Super Sugar Snap's vigorous, healthy vines average about 5 feet tall. IR: PLR, PM. Approximately 90-165 seeds per ounce. Pisum sativum Peas nourish our bodies with phytonutrients and, surprisingly, with omega-3 fatty acids. A hard-working crop, they improve the soil, fixing nitrogen that will feed future crops. Especially easy to grow in cool seasons. 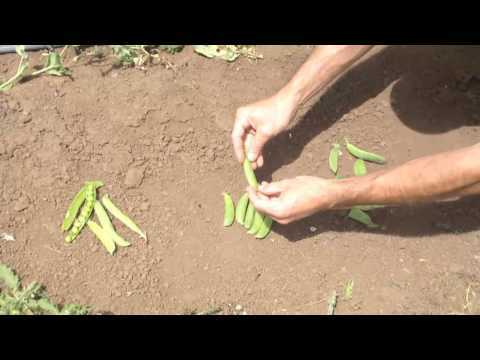 Snap peas have edible pods that are sweetest as the pods fatten up. High in vitamin C and niacin, they are most nutritious when fresh and briefly cooked. For the best nutrition and flavor, grow your own crops. Snap peas are the most productive of all the types of peas. Some snap peas develop strings that are easily removed by peeling them back as the pods are harvested. Days to maturity are calculated from the date of direct seeding. Note: In areas with mild winters such as the maritime Northwest, where peas can be planted in February, add 35-40 days. Super sugar snap is very sweet, juicy and productive. Need to plan for 6 foot vines and lots of picking time. Critter protection a must! I grow this variety every year. I have tried many other varieties but none are as productive, tall or tasty as this one. I have better luck with starting indoors and transplanting than with direct sowing. Plant early as it does not like the heat. Flavor is sweet, crunchy and very green. I live in Zone 8 in Washington State. This is my first season growing this pea pod variety. It is THE most successful variety I've ever planted. We live at 8600' elevation with shorter growing seasons. I planted these on the east side of our greenhouse and they appreciated the diffused afternoon sun. It's now early October with the temps 60/40 day/night. I'm still getting a handful every two days and the plants are still blooming. The vines grew to 6 feet tall. My second planting is now starting to produce. Don't know how long these will continue, but call me a Happy Gardener! These are on my "order again" list. Super Sugar Snap is Great!